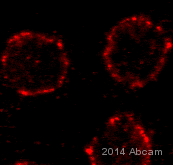 ab24609 reacts with Nuclear Pore Complex (NPC) Proteins. Aris et al ( J. Cell Biol. 108:2059-2067, 1989) report "In rat liver, this monoclonal antibody, mAb 414, binds to nuclear pore complex proteins, including one of molecular weight 62,000 (Davis, L. I., and G. Blobel. 1987. Proc. Natl. Acad. Sci. USA. 84:7552-7556). In yeast, mAb 414 cross reacts by immunoblotting with two proteins that have apparent molecular weights of 110,000 and 95,000, and are termed p110 and p95, respectively. Examination of subcellular fractions by immunoblotting shows that both p110 and p95 are located exclusively in the nuclear fraction. The mAb 414 immunoprecipitates several proteins from a crude yeast cell extract, including p110, p95, and a approximately 55-kD protein. Immunoprecipitation from subcellular fractions yields only p110 and p95 from purified nuclei, whereas the approximately 55-kD protein is immunoprecipitated from the soluble fraction. Digestion of purified nuclei with DNase to produce nuclear envelopes releases some of p110, but the majority of p110 is solubilized only after treatment of envelopes with 1 M NaCl. Immunofluorescence localization using yeast cells and isolated nuclei shows a punctate and patchy staining pattern of the nucleus." ab24609 recognizes the conserved domain FXFG repeats in nucleaporins like the p62, p152, p90. This is a reliable general purpose monoclonal antibody which recognizes a related family of NPC proteins. 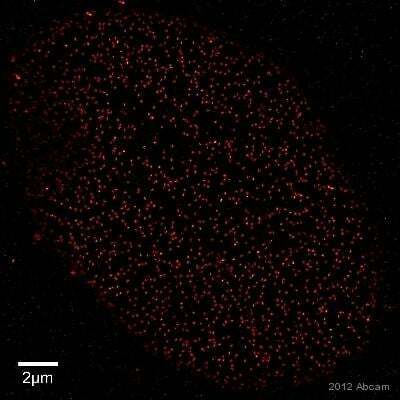 This antibody is ideal for studying the morphology and composition of the nucleus and nuclear envelope. It is also useful in studying changes in the nuclear structure during mitosis and meiosis. Our Abpromise guarantee covers the use of ab24609 in the following tested applications. WB 1/5000. Predicted molecular weight: 62 kDa. Suitable also in non reduced western blotting conditions (see Abreview). Nuclear extraction may be necessary (protocol detailed in Aris et al, http://www.jcb.org/cgi/reprint/108/6/2059). ICC/IF 1/5000. Fix cells with 4% paraformaldehyde in NWB (200 mM sucrose, 15 mM Hepes, pH 7.4, 50 mM NaCl, 2.5 mM MgCl2, and 1 mM DTT). Permeabilise with 0.1% NP-40 or 0.1% Triton X-100 in PBS for 2 min. (see Lopez-Soler reference); different customer have used this antibody at different dilutions for ICC/IF (see images below). We recommend that optimal working dilutions are determined by each customer. IP 1/5000. Nuclear extraction may be necessary (protocol detailed in Aris et al, http://www.jcb.org/cgi/reprint/108/6/2059). IHC-Fr Use at an assay dependent concentration. 4% paraformaldehyde fixed tissue cut on a cryostat (see Kimura reference). Essential component of nuclear pore complex. Required for the assembly of peripheral proteins into the nuclear pore complex. Nucleus > nuclear pore complex. Chromosome > centromere > kinetochore. Located on both the cytoplasmic and nuclear sides of the nuclear pore. During mitosis, localizes to the kinetochores. ab24609 staining nuclear pore complex proteins in Human chronic myelogenous leukemia cells from bone marrow cells. Cells were fixed with 4% paraformaldehyde in DPBS buffer for 20 mins and permeabilised with 0.1% Triton X-100 for 20 min at room temperature. 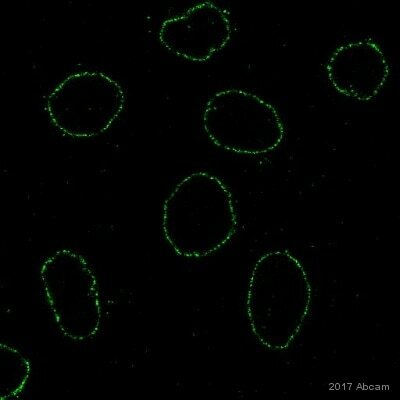 Cells were blocked with 2% normal goat serum in DPBS with 1% BSA and washed with 0.1% Tween 20.
ab24609 (1/200) staininig nuclear pore complex proteins in human RPE-1 cells (green). 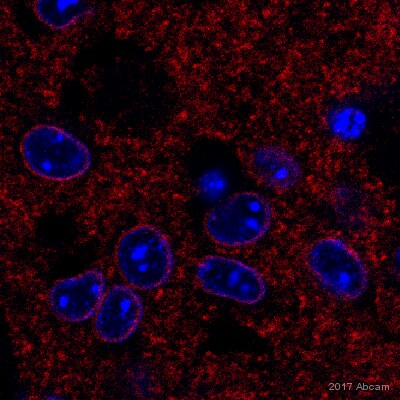 Cells were fixed in paraformaldehyde, permeabilised with Triton X100 and counterstained with DAPI in order to highlight the nucleus (blue). Please refer to abreview for further experimental details. ab24609 (1/500) staining nuclear pore complex proteins in human Hela Cells (green). Cells were fixed with Paraformaldehyde/Triton X-100 (10 min in PTEMF buffer (20mM PIPES, 1mM MgCl2, 10mM EGTA, 4% PFA) /0.2% Triton-X100 at room T°C) or Methanol (6 min in Methanol -20 °C , followed by 3 washes in 1x PBS) and counterstained with Dapi in order to highligh the nucleus (blue). 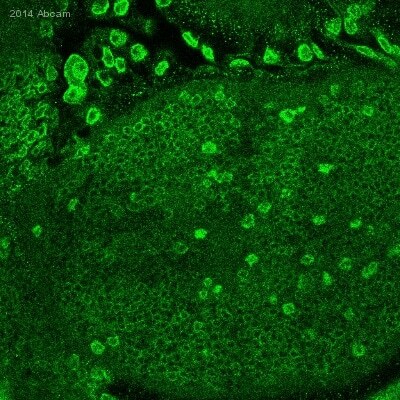 ab24609 (1/500) staining nuclear pore complex proteins in murine NIH/3T3 Cells (green). Cells were fixed with Paraformaldehyde/Triton X-100 (10 min in PTEMF buffer (20mM PIPES, 1mM MgCl2, 10mM EGTA, 4% PFA) /0.2% Triton-X100 at room T°C) or Methanol (6 min in Methanol -20 °C , followed by 3 washes in 1x PBS) and counterstained with Dapi in order to highligh the nucleus (blue). What is the epitope location? Is it outside or inside the nucleus? The staining pattern of this antibody should be nuclear or nuclear membrane. Hello. I'd like to buy Anti-Nuclear Pore Complex Proteins antibody [Mab414] - ChIP Grade (ab24609). We are using stem cells derived from cow. 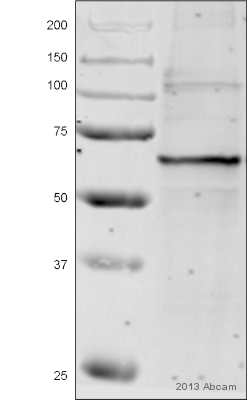 So I am wondering if ab24609 works well with cow cells. Thank you. I hope this information is helpful. Please let me know if you would like to participate in this program and test in cow. Also, please do not hesitate to contact us if you need any more advice or information. Thanks for looking into this for me. I am interested in submitting an Abreview for the experiment we discussed. I look forward to receiving the code so I can order one of these antibodies! I am very pleased to hear you would like to accept our offer and test one or both of these products in blocking experiements. Each code is associated with a paricular antibody so be sure tho reference the correct code when ordering and submitting the Abreview. Each will give you: 1 free PRIMARY ANTIBODY before the expiration date. To redeem this offer, please submit an Abreview and include this code in the “Additional Comments” section so we know the Abreview is for this promotion. Please remember that submission of the Abreview is sufficient for the discount code to become active. For more information on how to submit an Abreview, please visit the site: www.abcam.com/Abreviews. Remember, we publish both positive and negative Abreviews on our datasheets so please submit the results of your tests. The code will be active once the Abreview has been submitted and can be redeemed in one of the following ways: 1) Call to place your order and mention the code to our customer service department; 2) Include the code in your fax order; 3) Place your order on the web and enter the promotional code. Any feedback that you can provide will be greatly appreciated, whether positive or negative. If you have any further questions, please do not hesitate to contact us. We look forward to receiving your Abreview and wish you luck with your research. The terms and conditions applicable to this offer can be found here: www.abcam.com/collaborationdiscount.